Ambleside At The Lake has upgraded to Waterfront for 2017! 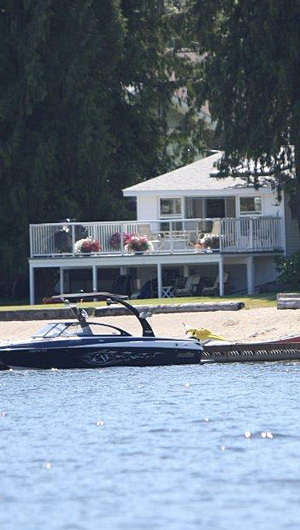 A prime waterfront location on Christina Lake, this 4 bedroom cabin & separate guest cottage combo, has 40' of grass to a large sandy beach with private dock! Recently renovated, the cabin is approximately 1300 sq/ft, has some modern upgrades, scenic photos of the area, and includes a 300 sq/ft deck that looks out to the lake with a glass railing to take in the panoramic views. These views can also be enjoyed from the kitchen, dining or sitting areas while inside. Ambleside At The Lake offers 3 bedrooms (2 queens, 1 double/single bunk), 1 bathroom, dining room, and sitting room plus a seperate detached guest cabin with queen bed and its own bathroom, perfect for families or friends. 9 people can sleep comfortably and possibly a couple more if we get creative! Partially shaded, the grass area to the lake is well maintained and is approximately 60' wide by 40' deep, with lots of room for outdoor games, bocce, badminton, or even a tent. Enjoy an evening campfire out on the lawn overlooking beautiful Christina Lake! The beach varies in size due to the water levels and on average is 60' wide with 20' of gentle sloping fine sand to crystal clear water. Water averages 22°C in summer. The property borders crown land, so there is an extra 50' buffer of forested privacy on one side. The driveway has room to park your vehicle/boat trailer, and the dock is available to moor your boat for the duration of your stay! Other features include TV/DVD, Wireless Internet, A/C, Stereo with IPod Docking, On-site Laundry, and natural gas BBQ on the deck. We are also planning to setup a fenced area outside for small/medium sized dogs or those family members who misbehave! All of this plus an easy walk to amenities. The Provincial Park beach, tennis courts, pickle ball courts, playground, bmx bike park, outdoor fitness park, ball diamond, soccer field, community hall, welcome centre, and ice cream shop are all only a few minutes walk away! The Christina Lake Golf Course is a 3 minute drive and there are miles of trails for walking, biking, and hiking that overlook the lake, rivers and valleys nearby. Some are listed in the Christina Lake Trail Map and be sure to check out our Links page for more maps and trails in the area. You don't want to miss the powerful water of the Kettle River crashing through Cascade Gorge which is a quick 2 minute drive away. If you would like to enjoy the lake in the winter months, there is skiing at the local Phoenix Mountain just past Grand Forks (about a 35 minute drive) and at Red Mountain in Rossland, BC about a 45 minute drive away. Red Mountain is a top-ranked BC interior ski resort with 360-Degree decents and 7 chair lifts with 110 marked runs. Inquire for vacation rental pricing and photos by emailing us at holiday@amblesideatthelake.com and be sure to visit the booking information page.